Wiley X has always been committed to providing the very best and most protective in tactical, outdoor, racing, and active lifestyle eyewear. Wiley X stays true to this commitment by creating a foundation of safety for each frame and ensuring that all of its lenses either meet or exceed ANSI Z87.1 safety standards for high-velocity impact and optical standards. Many Wiley X eyewear frames also exceed military specifications for ballistic impact protection. This is why Wiley X is trusted by active military personnel who need serious protection while in theater, extreme outdoorsmen, and weekend warriors alike. Wiley X focuses on constant innovation, and every new frame introduces a new edge of style, protection, or performance. The WX Saint is one of Wiley X's newest frames, and it truly embodies the Wiley X spirit of performance. Wiley X WX Saint Sunglasses have a streamlined design that is made to accommodate changeable lenses. This allows the frame to adjust to changing light conditions. WX Saint is rated as OSHA (Occupational Safety and Health Administration) grade occupational protective eyewear, and its shatterproof lenses block 100% of UV rays. WX Saint is a true ballistic frame, which not only meets ANSI Z87.1 standards but also exceeds MIL-PRF ballistic standards as well, making it an ideal frame for anyone who needs serious protection. Wiley X focuses on constant innovation, and every new frame introduces a new edge of style, protection, or performance. The WX Saint is one of Wiley X's most popular frames, and it truly embodies the Wiley X spirit of performance. Wiley X WX Saint Sunglasses have a streamlined design that is made to accommodate changeable lenses. This allows the frame to adjust to changing light conditions. WX Saint is rated as OSHA (Occupational Safety and Health Administration) grade occupational protective eyewear, and its shatterproof lenses block 100% of UV rays. WX Saint is a true ballistic frame, which not only meets ANSI Z87.1 standards but also exceeds MIL-PRF ballistic standards as well, making it an ideal frame for anyone who needs serious protection. Wiley X WX Hudson sports a bold street style that perfectly marries fashion and functionality. This sleek shape looks as good on the shooting range as it does in a shopping mall. While WX Hudson easily fills the role of a fashion frame, it is created with a backbone of pure performance. Like the WX Saint, WX Hudson is rated as OSHA grade occupational protective eyewear, and it is made with shatterproof lenses that block 100% of UV rays. It is also ANSI Z87.1 certified for high impact and optical performance. WX Hudson’s seamless combination of function and fashion creates a frame that is perfect for ladies who find excitement in more extreme places. 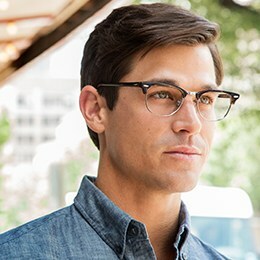 Both WX Saint and WX Hudson are available with prescription lenses. This means that all of the comfort, performance, and unmatched protection provided by Wiley X can be customized with a wide parameter of prescriptions. Perfect eyesight is extremely important when in dangerous and extreme situations, and Wiley X prescription sunglasses are made with precision and accuracy to ensure the very best in vision quality and eye protection. The Climate Control Series of frames features technology that is unique to Wiley X. The Climate Control top down ventilation system keeps the lenses free from fog formed by sweat and humidity, and the facial cavity seal is made with a patented removable facial cavity, which provides sealed protection from the elements, including wind, dirt, and debris. A specially designed "rim" securely holds a prescription lens in place. This technology has made these battlefield-proven frames accessible to those who require both corrective lenses and unparalleled protection. The Wiley X prescription rim system has expanded the prescription lens options of its one of a kind Climate Control series. The Wiley X RX Rim system accommodates prescriptions up to +5.00 and -7.00, making eye protection on- and off-the-job accessible for people with strong prescriptions. Wiley X is always thinking one step ahead of the competition, and its progressive designs and cutting-edge technology continue to deliver eyewear that is nothing short of pure performance. Check out the entire Wiley X Eyewear line of products.